I have recently finished reading a Nature news feature on noise in gene expression (The Cellular Hullabaloo). It left me with this increased understanding of cellular processes and in terms of controlling chaos, fitted nicely with something I have blogged about before, which is Hsp’s (especially Hsp90). According to this news feature, several studies have found that there are significant differences in the expression of genes both in duration and strength, even between cells that were expected to be identical. This contradicts the current notion of gene expression as an orderly sequential and structured phenomenon. These studies seem to indicate that gene expression occurs randomly, throughout the whole genome. 1. Controlling randomness (noise) requires a lot of energy, the more chaos the less energy spent. Consequently, only the most critical cellular processes are under tight control, and the rest are more or less random. 2. Expression noise may enable cells to fight off threats. Say a certain level of protein is required to survive a toxic compound attack. Then having cells with sufficient levels of defender protein is more probable in a (noisy) cell population with varying gene expression levels, than in cell populations with a constant level of expression. 3. Randomness may ensure variation in differentiation. An example given in the news feature is the differentiation of blue and green light sensing photoreceptors in drosophila. So, the noise is there for a reason. Noise, or more precisely – random fluctuation, is an ubiquitous cellular phenomenon. But cells of a given type still end up with similar morphology and similar functionality. The beauty of nature is how the randomness is controlled just enough to achieve the minimum amount of order necessary for preserving functionality. Also, in keeping the random events, flexibility is preserved for future adaptation. The chaos extends further than gene-expression. If you also consider variations in insertions/deletions, gene copy number and epigenetic differences, the potential for random variation at the gene level becomes evident. To control some of this genetic randomness you have proteins like Hsp90 that masks genetic variation at the transcription level (or folding level to be precise). This is an important control-mode for some of the chaos (DNA sequence variation and mutations) and at the same time it enables sudden exposure of chaos to achieve rapid morphological evolution if needed. I am pretty sure that similar (or very different) control mechanisms will be discovered for gene expression noise in the future. The noisy expression story is another illustration of how we are not just our genes. The DNA-sequence may be a defining starting point, but there are levels and levels of variation on top of that. As multicellular and evolving organisms, we are constantly balancing between chaos and order. The chaos-level is maximized to minimize energy expenditure and to ensure a multitude of possible paths to follow in an organisms future biological evolution. The balance is oh so beautiful, it’s called nature. To begin lets look at the problem of rapid evolution. Darwinian evolution is based on a constant rate of random mutations in the genome of any evolving organism. This implies that mutations happens constantly, by chance, regardless of the external environment. Adaptations consequently arise by chance. 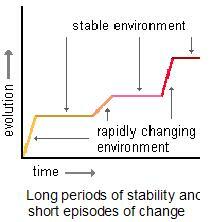 Evolution of new traits one may think, is therefore slow and gradual. Since such a view, does not fit with the bursts of evolution observed in fossil material, alternative explanations have been put forward (see more below). However, even when using a constant random rate of mutations one would expect “bursts” or rapid transitions. This is elegantly illustrated in this simulation of an evolving clockwork. Since a beneficial mutation can have a profound impact on fitness, then there should be no surprise that the transition between av less fit form and a more fit one, happens quickly. Thus even with a constant mutation rate one would probably not see a slow, gradual evolution of species, – basic math skills on exponential growth should make this clear. Why this notion of gradual evolution is prevailing I cannot understand. In addition there are those that believe that the mutation rate may not be constant. Thus, with an increased mutation rate and rapid transitions one can start to explain the observed bursts of evolution. Further explaining bursts of evolution we have the theory of ‘punctuated equilibria’, associated with Niles Eldredge and Stephen Jay Gould, which states that organisms go through short periods of rapid evolution from time to time, against a background of relative stasis (see picture below, and this genomicron post as a starting point for more on punctuated equilibrium ). Punctuated equilibrium (reproduced with permission from Dr. Dennis O’Neil, for his tutorials on evolution go here and here). This has further led to the theory of hopeful monsters. These theories account for non-linear rapid evolution within the boundaries of Darwinian principles, but they have been heavily criticed. One of the main criticisms of these theories, as far as I can understand, is the improbability of a single mutation to give rise to radical morphological changes, and further that this change, if it happens, is most likely deleterious, and if it against all odds is beneficial, its even more improbable that this individual is able to produce offspring with the same trait(s). So we are still left with some problems: External environment changes can happen really quickly. Is random mutation events, occurring at a slow rate (even if it’s sped up in larger populations or even if monster are hopeful in times of stress), sufficient to explain the effectiveness of adaptations seen in nature ? Does an organism rely on (slow) random mutations to evolve a trait to help the species adapt to the new environment, or are there additional mechanisms in place to speed up this mutation rate and perhaps guide mutation events towards selected genes that allows rapid changes in phenotypes ? The hypothesis is the following: If there is a way to mask (deleterious) changes in proteins under normal conditions, one may accumulate such changes without exposing them. Illustration from Sangster TA et al. (more on Waddington will follow in the last post). Thus, with Hsp90 acting as a buffer: one could potentially get a lot of hopeful monsters, under times of stress, as these traits were exposed. This would drastically increase the chances of a beneficial change to occur at the right time. And since the chance of mating with other monsters with similar traits (there are more than one monster, in fact very many), the chance of keeping the trait(s) in subsequent generations is also increased. Now missing……..evidence, which will follow in the next post. Chapter I gave an introduction into the role of Heat Shock Protein 90 (Hsp90) in evolution. The main point was its ability to mask/hide transforming mutations until needed in stressful times. This chapter describes its physical and biological properties. Picture from: Dollins, E.D., Warren, J.J., Immormino, R.M. and Gewirth, D.T. (2007) Structures of GRP94-Nucleotide Complexes Reveal Mechanistic Differences between the hsp90 Chaperones. Molec. Cell 28:41-56. From Sandwalk: The complete protein is a dimer of two identical subunits. Each monomer has three distinct domains; an N-terminal domain (N); a middle domain (M); and a C-terminal domain (C). The ATP hydrolysis site sits at the interface between the N and M domains. The C domains interact to form the dimer. The presumed site of binding for misfolded proteins (“client” site”) is in the V-shaped pocket formed when the C domains come together. The mechanism of action of Hsp90 proteins is not known although it presumably involves a conformational change induced by ATP hydrolysis. Model of the activation of a client protein by chaperone machines. The chaperone Hsp70 system targets the client protein, in this case the steroid receptor, to the Hsp90 chaperone via the organising protein HOP which binds both chaperones. After transferring the steroid receptor to Hsp90, Hsp70 dissociates and is replaced by co-chaperones such as p23 and the high molecular weight immunophilin FKBP52. It is only in this complex that the steroid receptor is activated to bind ligand with high affinity. 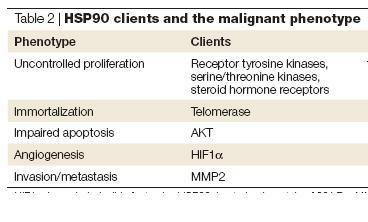 Hsp 90 and Proteins it interacts with. The abundant protein Hsp90 is thought to assist in the activation and assembly of specific proteins. Many of these proteins are critical for signal transduction and cell division. As a result, Hsp90 is a target for anti-tumour drugs. Other examples are: PDK1, PKC-gamma, vSRC/cSRC, PPAR-alpha and p53. A comprehensive list of interacting proteins compiled by Picard Laboratory can be found here. Thus, looking at all the proteins that can be affected by Hsp90, there is no surprise that the protein is highly conserved and that effects are profound when Hsp90 is fiddled with. to this (a hopeful monster ?). The protein in focus, Heat Shock Protein 90, is otherwise as normal as a protein can get. It is ubiquitously expressed in all cells and across species, and its function is the same as other heat shock proteins, it’s a chaperone. A chaperone is a protein that helps other proteins fold correctly (or prevents them to aggregate into non-functional protein junk). Without the chaperone the protein would not achieve an active conformation and end up being degraded. For an excellent video illustrating chaperone assisted protein folding go here. Now, it turns out that the Hsp90 chaperone function is important for development and evolution of new traits. To illuminate this, the first paper I will discuss is from 1998 by Susan Lindquist’s lab at the Whitehead Institute. In this paper they take fruit flies and reduce the expression of Hsp90. As I shall come back to later, this is the experimental equivalent to a stressful condition (like for instance high temperature). They can’t knock out Hsp90, because a complete lack of it is not compatible with life (which demonstrates the importance of this protein). When Hsp90 levels are reduced, the fruit flies are born with a number of different defects ranging from defects in the legs and bristles to defects in the eye (see image above). Now, this could be expected when knocking out a protein, but such extensive morphologic changes are not expected from just reducing the levels of a protein (unless maybe if it’s a transcription factor, which it isn’t). The hypothesis explaining this goes as follows……Since Hsp90 is a heat shock protein it is helping other proteins fold. When stressful conditions occur, there will be more proteins that are in need of folding-help, thus some of the proteins that under normal conditions got their help from Hsp90 will now be left on their own. Since, under such conditions, you see these extensive morphological changes, these proteins must be doing something out of the ordinary when on their own, or if they aggregate, their absence causes abnormality. The theory states that these in-need-of-help-proteins must have accumulated mutations that potentially causes abnormality, but under normal conditions they are still able to perform normally due to the action of Hsp90. The implications for evolution are breathtaking since this means that an organism can accumulate a number of mutations and still function normally, but when exposed to stressful conditions, the changes at the protein level are suddenly exposed in their offspring and appear as physical abnormalities. This allows for extremely rapid evolution and could potentially enable a species to change in just a couple of generations. Illustration of the process and further evidence for this theory will be presented in the next 4 posts the next 4 days, in SciPhu for just science 08. I have so much to learn, and I’m looking so much forward to learning it. This time around it’s in evolution theory, and I’m going to make some bold statements while learning. Knocking down Hsp90 creates rapid morphological changes from one generation to the next (for details see references in my previous posts Evolution too fast for our genes to follow, On Hsp90 and morphological evolution and The rate of evolution/mutation/adaptation and future posts to come). Hsp90 does so by masking mutations under normal conditions and then revealing them under stressful conditions. Just to repeat myself, – this concept suddenly made evolution comprehensible to me, and I do not understand why other scientists haven’t embraced the masking concept as a revolutionary concept, expanding darwinian evolution theory. Now it’s dawning on me why…….Such masking of mutations to produce a pool of potentially crucial mutations gives support to the hopeful monster theory. One of the main criticisms of this theory, as far as I can understand, is the improbability of a single mutation to give rise to radical morphological changes, and further that this change, if it happens, is most likely deleterious, and if it against all odds is beneficial, its even more improbable that this individual is able to produce offspring with the same trait(s). But…..
With Hsp90 as a player in the game, it need not be a single mutation, but rather a pool of mutations already present and waiting to be exposed under stress. That increases the chances of achieving multiple changes in multiple individuals. Consequently the chance(s) of producing one or more beneficial trait(s) is(are) increased. In addition, if such stress appears and mutations are revealed, then many individual offspring will have extensive changes, and the chances for two such individuals to mate increase dramatically. Thus, I cannot see why a combination of the hopeful monster theory and the actions of Hsp90 (and possibly other mutation masking proteins) under stressful conditions, is a perfectly credible extension to darwinian evolution. An extension that can explain some of the rapid changes that has occured during evolution of species.